A few weeks after they opened, I had heard some positive buzz about their food on Twitter and decided to finally check it out. It was a chilly Saturday night and I had just put duck legs in the oven. We planned on grabbing a martini and possibly a bite or two while the duck braised. Zach and I both opted for Death’s Door in our martinis–gin for him and vodka for me, of course. We perused the menu and chatted with Jen as she mixed our drinks. I, not unusually, wanted pretty much everything on their menu which is divided into meats, pickles, cheeses, small plates and large plates. We decided on a cheese and a small plate. We were immediately drawn to the Bayley Hazen Blue cheese with SMOKED BACON CARAMEL. I mean, I love blue cheese but add bacon AND caramel. I was sold. 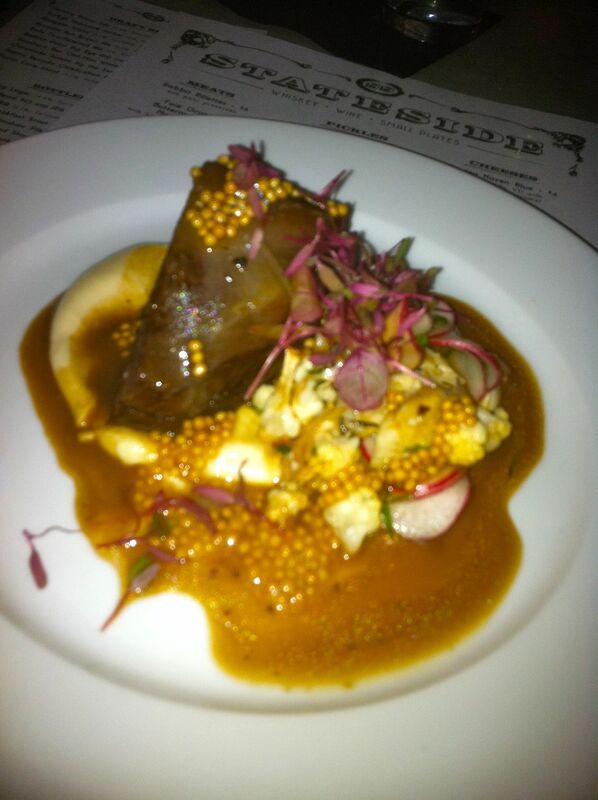 It was a little tougher to pick just one small plate but we ended up agreeing on the beer braised beef cheeks with cauliflower puree, radish and pickled mustard seeds. Next came the beef cheeks. Don’t you just love their menu font, by the way? These beef cheeks are perhaps the favorite thing I’ve eaten at Stateside thus far. While the meat was good (and it was damn good and buttery soft,) it was the accompaniments that shone. The cauliflower puree was rich and creamy and I could only imagine what it was doing to my arteries while the pickled mustard seeds popped at just the right moments. The best bite was a piece of meat and a dollop of puree swirled in the braising liquid. This was a memorable dish. Unfortunately, our braise beckoned and we begrudgingly walked home, happy to have found our perfect neighborhood gem for that night when we just want a well-mixed drink and tasty bite at the bar. We went back the next weekend, of course. When we stepped through the door, the general manager, Anthony, greeted us with “good to see you again.” This was the neighbor-friendly service that was always lacking for me at Green Eggs. 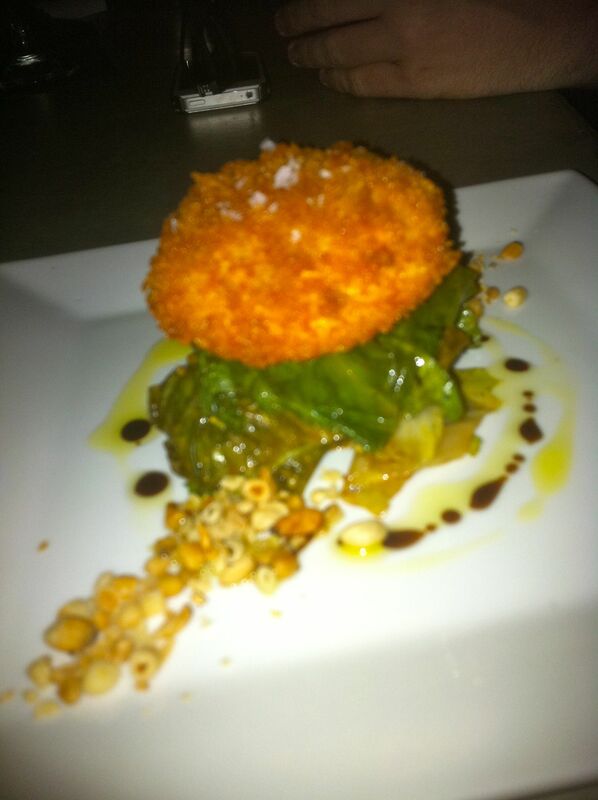 That visit and future ones gave us gems like the crunchy house made goat cheese. 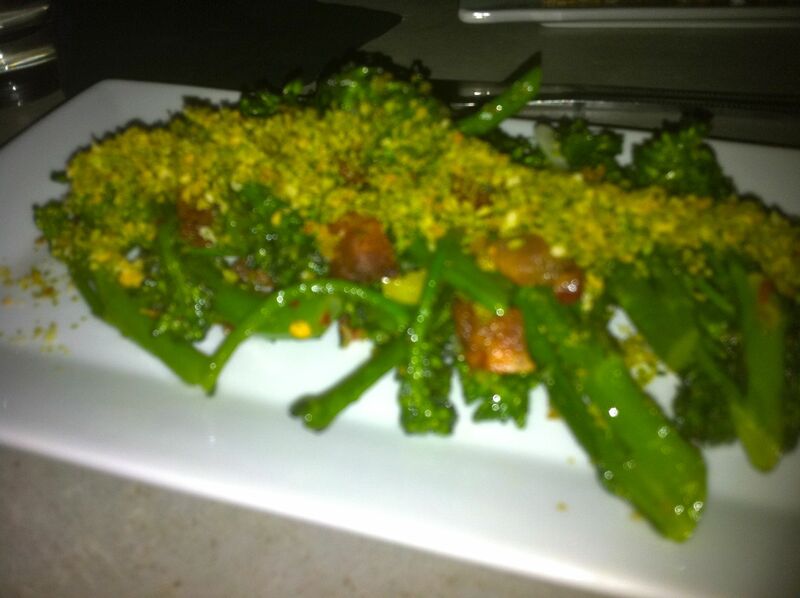 We have also enjoyed charred broccolini (great sleeper dish) and duck sausage with sweet potato, sour cherry mustard and frisee. 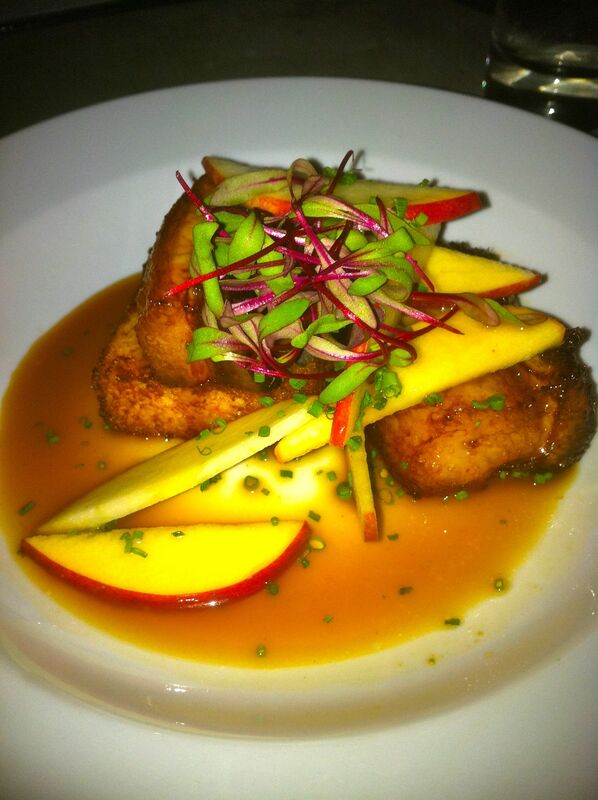 More recently, we finally got a chance to try the crispy maple glazed pork belly over fried nora nora grits, gala apples and spiced cider jus. 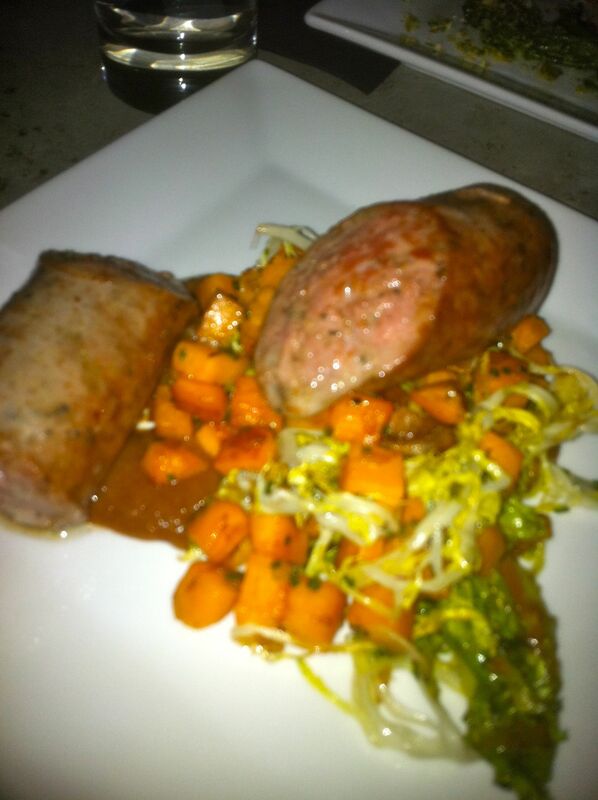 Everything about this dish was phenomenal. Duh. I don’t have to tell you that though–just look at it. The pork belly followed the beef cheeks in highlighting and focusing on not just the main protein but every component of the dish. 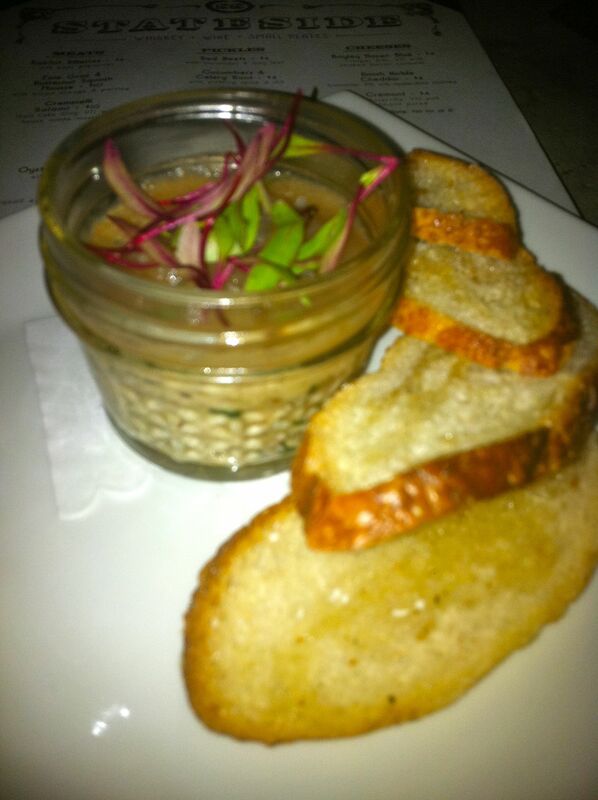 As a special treat, Anthony brought out the rabbitt rillettes with pear preserves. This is something I never would have ordered but that’s what made it especially neat to taste. This dish was subtle, yet robust. While the flavor was not overwhelming, it had an easy “eatability” to it. Another perfect bar snack to share with some of your favorite people. Besides, the jar they serve it in is just so darn cute. I cannot say enough good things about this place. From the front of the house to the back of the house, this restaurant aims to please and achieves on so, so many levels. I just hope, for our sake, that it doesn’t get too popular and will be able remain our neighborhood gem where we can always snag two seats at the bar. I won’t hold my breath though. 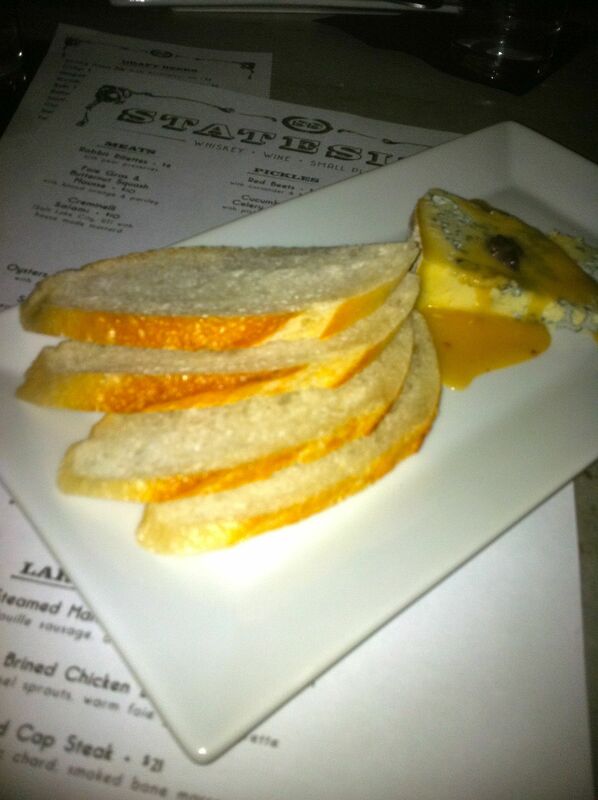 If you haven’t eaten at Stateside, get there now. Seriously. Our cocktails were delicious, I can’t wait to eat a full meal here!